12 Reasons why you should NEVER visit Seville. It is always sunny (you know how annoying the sun can be). There are 40.000 orange trees in the city so if you come during April, May or June you will have to smell the orange blossom 24/7. Guadalquivir river is the only navigable river of Spain and you can sunbathe at its shores. Triana is not only a neighbourhood of Seville but also where FLAMENCO was born. Sevilla has several narrow streets for shade, therfore you will get lost walking around. The Holy Week has 68 official processions that go out during one week in April. The whole city shuts down and dedicates its body and soul to them. La Feria is our biggest Festival, now it lasts 10 days, its always two weeks after Easter and for a week we only dress pretty, dance, eat and drink. We have all kinds of tapas, whether you eat everything, are vegetarian or vegan, we have all the food!!!! Our Cathedral is the biggest of the world (unless you pay attention to Rome, then we’re 3rd). Star Wars’ Planet Naboo is here and you can visit whenever you want if you go to Plaza de España, you don’t even need the Millenium Falcon!! 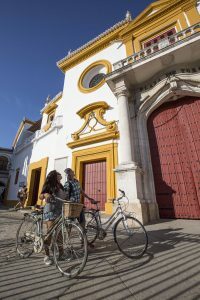 Sevilla has more than 180kms of bike lanes!